First of all, we inject the nest with a small amount of insecticide. If we cannot get to the nest ie: it is in a cavity wall we inject the area where the wasps are entering and leaving the nest. This means wasps cannot feed the nest and one of the wasps will carry the insecticide into the nest thereby killing the wasp nest. We GUARANTEE to kill the nest. The nest must stay in place because of wasps out foraging need to return to the nest. If the wasps can’t find a nest they will just fly around trying to find it, so if you take the nest away on the same day you will have a lot of wasps flying around your property. The nest is made of paper mache so it really doesn’t need to be removed. If the nest has to be removed we recommend you wait for a couple of weeks for the wasp nest to die, before you remove it. My name is Paul and together with my wife Karen, we run Your Pest Control. You can be assured that when you call any of our pest control numbers you will be talking to one of the owners, not somebody working in a call centre. To put it another way, you the customer are our main concern, not shareholders or directors. Consequently, we can offer a great customer service. I am personally CRB/DBS checked. This means you can have complete confidence in my integrity and honesty when I attend your premises. 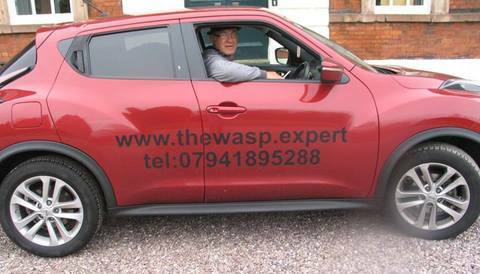 If you are elderly, vulnerable or a woman living on her own you can rest assured I am the person you are looking for to deal with your wasp nest problem. Furthermore, I am committed to giving you a top quality wasp nest removal service at an affordable price. In addition, We fully guarantee all our work and are fully insured. All work is carried out in a professional and timely manner. We also carry bee suits so we can carefully approach the nest and safely deal with it. 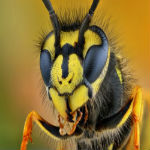 The cost of wasp nest removal is £45.00, even at the weekend or later at night. The only exception to this is if the nest is in an inaccesible location. We may need to use more specialist equipent to access the nest. We guarantee to beat the price of your local council. Some of the bigger company's charge over £300.00 for doing essentially the same work. Some charge less than us but not by much. Queen wasps awaken from hibernation about the middle of April and set about the task of building their nests. Wasps collect dead wood which they mix with wasp saliva to form a type of paper mache. From this, they construct their nest. She can choose any location from a hole in the ground to under the ridge tile of a building and anywhere in between. In the springtime usually about mid-April, she builds a nest about the size of a golf ball and in here she will build cells and lay about a dozen eggs which she tends and feeds. The eggs take about two weeks to develop into the wasps we are familiar with. The length of time it takes for a wasp to develop is dependant on the amount of food the Queen wasp is able to find. When the workers emerge they take over the expansion of the nest and the feeding of the young leaving the Queen to her only task of laying eggs. As more workers hatch the nest can quickly grow, doubling in size in a week. As a result, this can bring problems to the householder. The one problem wasps have is they are not very good at choosing nest sites. If you have a wasp nest on your property you may hear a ticking or crackling sound coming from the nest, this is the wasps’ mandibles clicking together as they try to expand their nest. They will be chewing away at the plasterboard usually in a bedroom. I have also seen wasps flying away from the nest with little polystyrene balls which is your cavity wall insulation. 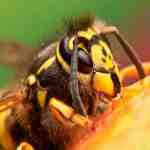 Skelmersdale Wasp Nest Removal : What Do Wasps Eat? A worker wasp has a proboscis to drink liquid with and they get the liquid they need from wasp larvae. The worker will go out and catch all manner of insects which they take back to the nest to feed the larvae. In return, the larvae exude a sweet sugary liquid called chitin which the wasps now drink. This gives them a sugar hit encouraging them to go and get more insects. As the weeks go by the nest gets bigger and bigger. They become more noticeable in July as more and more workers hatch. If you have a wasp nest you will be able to see a constant stream of wasps going to and from the nest. In the event that you find a wasp nest on your property DO NOT approach the nest. Dealing with a wasp nest can be very dangerous! Wasp’s will attack in numbers if they believe there is a threat to the nest nearby. The Queen wasp determines the aggressiveness of a wasp nest. If the nest is very aggressive as you approach the nest returning wasps will fly towards you instead of going in the nest. A wasp sting is very painful and could lead to Anaphylactic Shock and in rare cases death. In the meantime, the nest continues to grow through July and August and at its height can contain 10,000+ wasps. Eventually, in mid-September around 2000 new Queens hatch out along with drones. These new Queens now finally leave the nest never to return and prepare for hibernation. The wasp colony structure begins to break down about this time and wasps start to crave their sugar hit. This is because the queen has stopped laying eggs and there are no young to feed. Now wasps start to feed on fermenting fruit ( becoming drunk? ) and start to become a nuisance. They want your sweet sugary drink etc. In October the nest will die off naturally. We also offer an EMERGENCY CALL OUT SERVICE at a cost of 150 pounds. Although this may seem expensive you should only use this service if you really need it ie: Wasps have made a hole in the bedroom ceiling and are infesting the room and you need the problem fixing as soon as possible. This service requires needs paying for in advance and you must phone 07941 895 288 to book the treatment. We will make your problem a high priority and will endeavour to get to your premises within one hour. Bonus Second Wasp Nest treated Free On The Same Visit And The Same Property.